HILO » The Bridges of Hawaii County might sound like the title of a movie with Clint Eastwood and Meryl Streep, but don't expect any awards. 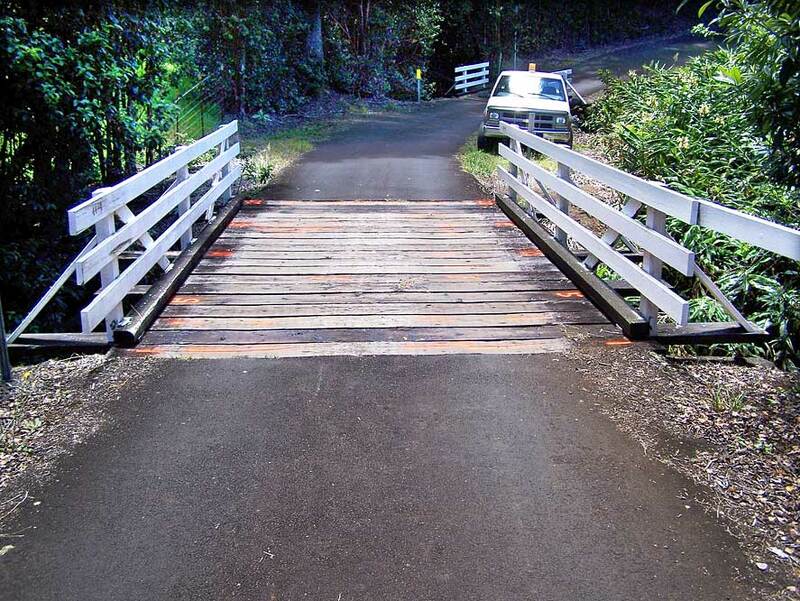 The Hawaii County Department of Public Works is aware that its new series of brochures on Big Island bridges sounds like the 1995 movie hit "The Bridges of Madison County." But when it comes to star appeal, despite his jaunty straw hat, Public Works chief Bruce McClure is somewhat shorter and rounder than tall, lean Eastwood. And the department's information specialist, Noelani Whittington, adds, "Bruce McClure does not have a romantic relationship with Meryl Streep." Underlying this playfulness is a serious intent: to save lives. After the Silver Bridge over the Ohio River collapsed in 1967, killing 46 people, the federal government mandated routine bridge inspections across the nation. Hawaii County is now on a cycle of checking the 127 bridges under its care every two years, said the county's bridge program coordinator, Gene Quiamas. Twenty-eight of those bridges are wooden, 10 of them in a small upland area at Kalopa and Paauilo on the Hamakua Coast north of Hilo. Some date to the 1920s. Many new residents building homes in the area might not be aware of weight limits on the small bridges serving the building sites, Whittington said. So Hawaii County decided to go beyond inspections and produce a series of brochures on the bridges of Hawaii County. Upland Kalopa and Paauilo, off the beaten track but with many old bridges, was the first area selected. Besides residents, commercial truckers serving the new homes also have to cross those old bridges. The county sent copies of the one-page, double-sided brochure to freight forwarders, concrete haulers, construction materials companies, furniture companies and other businesses that could drive heavy trucks in the area, Whittington said. The brochure includes a map and photos of 19 bridges in the area. An online version of the brochure can be seen by visiting www.co.hawaii.hi.us, clicking on "projects update" and then looking under East Hawaii for bridges.